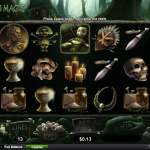 There are a couple of voodoo themed slots out there on the net, but so few of them really nail the theme down quite like the RealTime Gaming (RTG) slot, Voodoo Magic. This slot’s wonderful imagery really does tell a tale, and make the game stand out from its rivals. 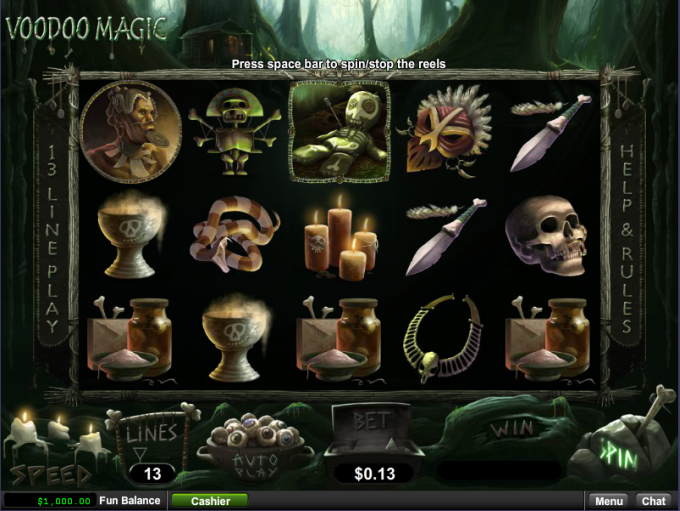 Voodoo Magic features 5 reels and just 13 paylines of action, with players able to adjust those paylines as they see fit. 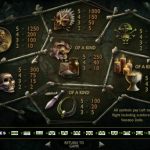 Players will find that Voodoo Magic’s total bets range from 0.01 per line per spin, up to just 13.00 per spin. This is not the most expensive slot you will ever come across. As for winnings, players can hope to pocket wins worth as much as 2,000 coins in all, by landing 5 wild symbols on any active line in the slot. 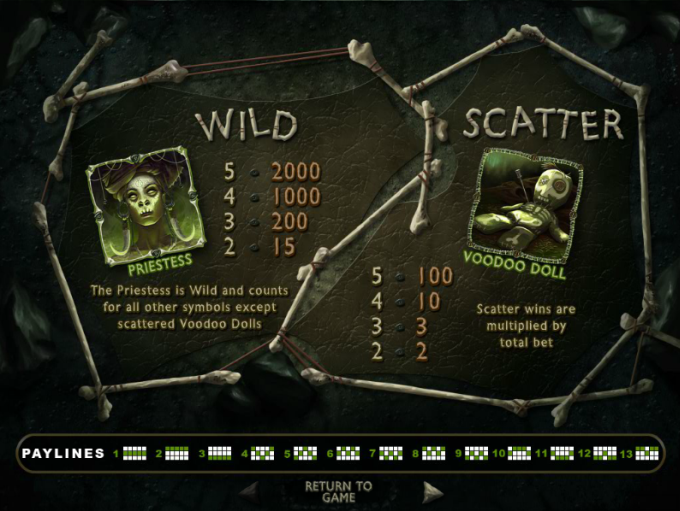 Wild symbols take on the shape of a voodoo priestess, and these symbols can substitute for all others in the game, except for scatter icons, which appear as voodoo dolls. As mentioned, they can also see you win the non-progressive jackpot if 5 appear on a line. 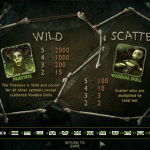 Scattered voodoo dolls can boost your wins by 2x, 3x, 10x, or even 100x your total bet if 2, 3, 4 or 5 such symbols appear anywhere on the reels. Players should know that voodoo doll scatters can also trigger a free spins bonus I 3 or more appear anywhere on the reels during a single spin. 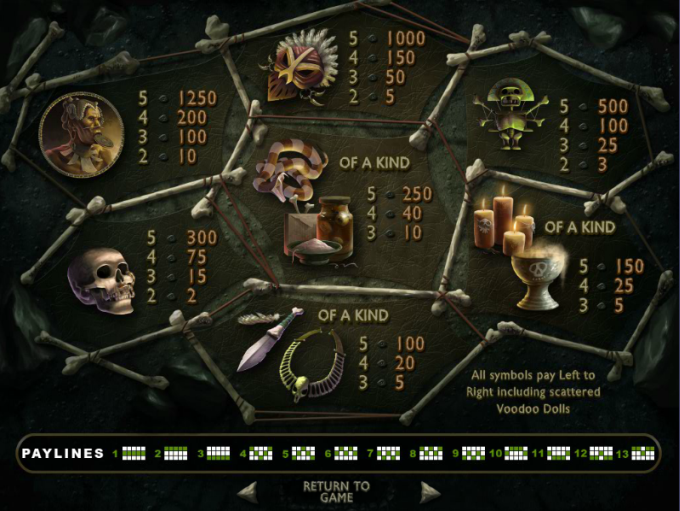 Standard paying symbols in this slot machine include necklaces and daggers, chalices, candles, jars, snakes, skulls, masks, and more bizarre, but equally as frightening images, which can result in wins which range from 2 coins up to 1,250 coins in all. The Black Magic Free Spins bonus round can see you begin the feature with up to 25 free spins in all. During the bonus, a Magic Multiplier could see you land increasing multipliers on each spin. Don’t be surprised to find multipliers rising from 1x and upwards on each spin. During the bonus, scatter icons do not appear on the reels, so there is no way for you to retrigger the feature. This is the game’s solo bonus round, so players are going to have to make the most of it when they trigger it.